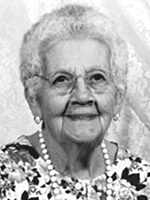 Lyda Victoria (Cooke) Manriquez, 97, died on Feb. 25 of natural causes. Lyda, aka Lydia, was born May 31, 1905, in Castaic, Ca., and resided in Santa Clarita. She was a volunteer at the SCV Senior Center for more than 20 years and was the oldest member of the San Fernando Band of Mission Indians. She is survived by her son, Donald Manriquez of Idaho; daughters Orlena Salinas of Saugus, Elaine Yniguez of Palmdale, and Barbara Allen and Nora Ellerman of Welden; as well as several grandchildren, great-grandchildren, great-great grandchildren; nieces and nephews. Services will be held Sunday, March 2, from 6 p.m. to 8 p.m. with a vigil service at 7 p.m. at JTOswald Mortuary, San Fernando. A funeral mass will be held Monday, March 3, at 10:30 a.m., at San Fernando Rey Mission Chapel, followed by interment at San Fernando Mission Cemetery in Mission Hills. 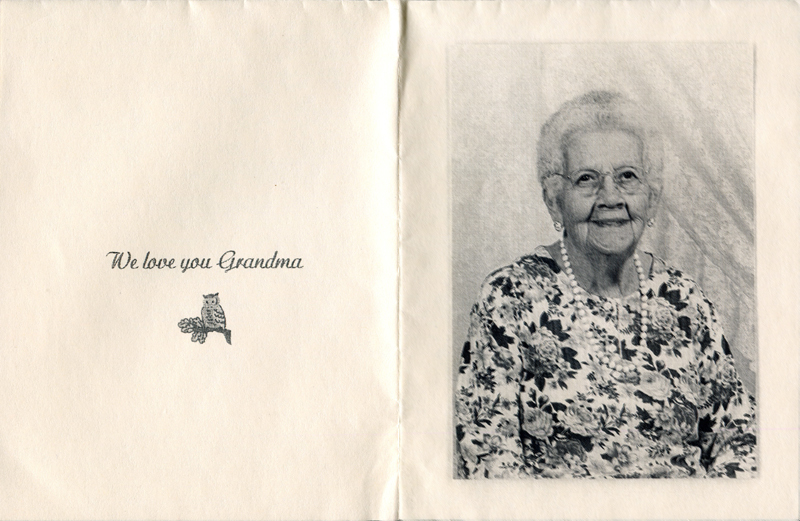 Her family wrote, "We love you and we will miss you." 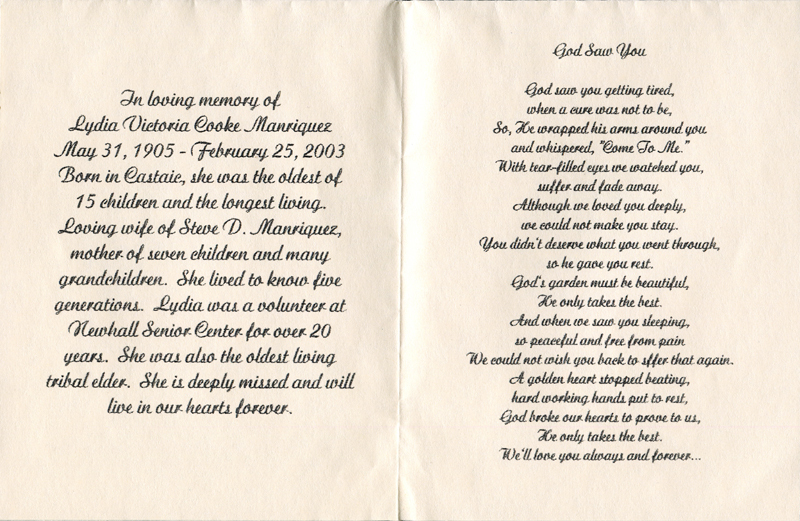 Webmaster's note: The memorial service program (above) states that Lyda (aka Lydia) was the oldest of Fred and Frances Garcia's 15 children; however, she was in fact the youngest girl. (Source: Caroline Ward Holland 2014). Mary, for one, was certainly older, as indicated here. 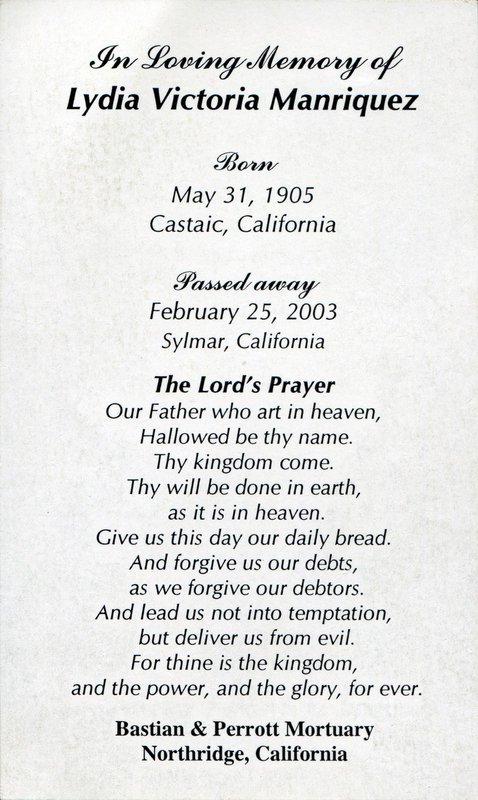 In loving memory of / Lydia Victoria Cooke Manriquez / May 31, 1905 - February 25, 2003 / Born in Castaic, she was the oldest of 15 children and the longest living. Loving wife of Steve D. Manriquez, mother of seven children and many grandchildren. She lived to know five generations. 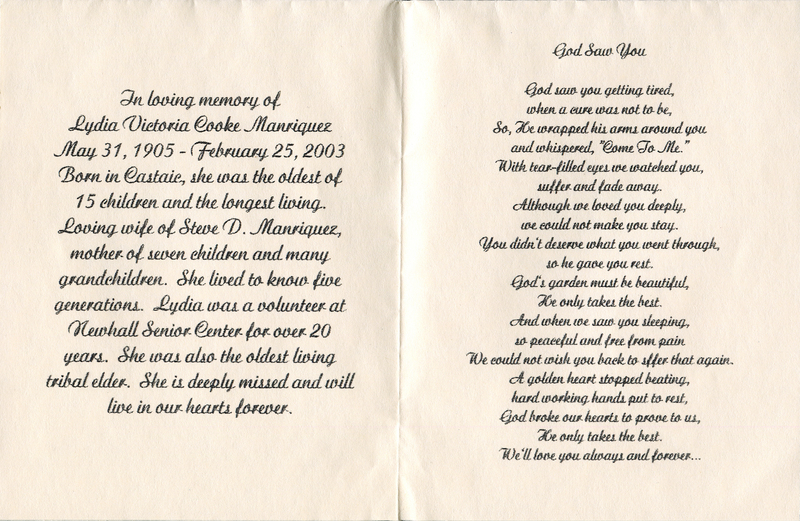 Lydia was a volunteer at Newhall Senior Center for over 20 years. She was also the oldest living tribal elder. She is deeply missed and will live in our hearts forever. Program courtesy of Ernestine Agnes Cooke (Thomas).